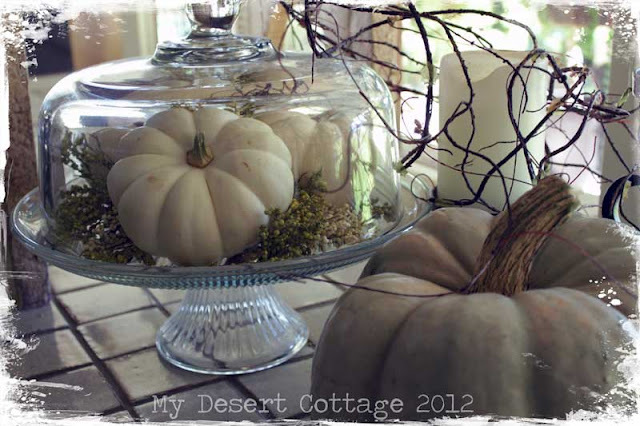 **My Desert Cottage**: Fall Decor and Becky's first Blissful Whites Wednesday!!! Fall Decor and Becky's first Blissful Whites Wednesday!!! Fall is one of those seasons that I look forward to every year. It is the time when the heat finally begins to fade here in the Arizona desert. Mornings and Evenings begin to cool down and I finally get to sleep with the windows open. Unfortunately it occurs rather late in the year for us. Temps have only just begin to dip below 90 for the daytime highs, so it can be hard to really get in the spirit and go all out for Fall decorating. I do however have my weaknesses. White pumpkins being among them. It was great to bring out the handmade pumpkins I made a couple of years ago. Bringing out the old decorations is like saying hello to old friends. If you would like to make some yourself, you can find a tutorial for them here. One of the things I'm so happy about is the recent availability of other varieties of pumpkins here in the valley. In addition to white, we can also those yummy grey green pumpkins too! Well, you can see I don't go too crazy with fall decor here, but I love the little that I do. As many of you know, Kathleen over at Faded Charm has retired her White Wednesday party. We all miss her party very much, so I am very happy to tell you (if you don't already know) that Becky over at Timewashed has picked up the reigns and will continue to throw her own version, called Blissful Whites Wednesday! Please pop over there and join in on the fun. I know she would love to have you! I love your Whites...your fall decor looks so great. I hope you have a wonderful rest of your week. Hi Karen! 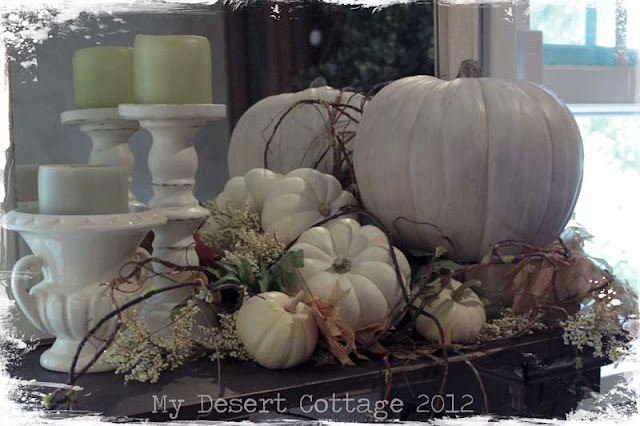 Oh, what a beautiful vignette with all the white pumpkins! I think you did just fine, Karen! I kept it pretty simple this year myself. Kind of hard with the warm temps. We aren't as hot as you but have been having some 76 degree days. I love the pumpkins you made. I have a weakness for those yummy white pumpkins, too! Actually, I love all pumpkins...especially any that don't look like the typical pumpkins!! Beautiful Karen, I love your white pumpkins! Your fall decorations are perfect. It is finally cooling off here in NC. It can be very very hot even in October. I love it when it cools off. Love your pretty white pumpkin displays! Your White Pumpkins are Lovely Karen and Thanks for the Tutorial Link. My weakness happens to be Velvet Pumpkins... I'm Creating a virtual Pumpkin Patch of them in fact as I add to the Harvest each year! *LOL* Yes... isn't the Arizona weather getting Glorious now!!! My Fav time of year here in fact. So pretty love all the white. Happy Fall. Skønne græskar opstillinger, og der blev jeg overraskede, tænk du laver dem selv!! jeg spoler lidt rundt på din blog, (det er en stor fornøjelse og meget inspirerende) du er så kreativ og fuld af gode ideer. knus morkaren. just darling, loved them everyone. thanks for letting us know about blissful whites. white pumpkins have a magic about them!!! Hi Karen, Love your whites and your pumpkins vignettes. So inspiring. This was so fun to join in. Have a great rest of the week and happy creating. You have a perfect Blissful White Wednesday post! Your displays are gorgeous. Karen, what lovely Fall vignettes! I love your white pumpkins, the had made pumpkins and the vintage books! It'a all so pretty! Even though you go light on Fall decor, your vignettes using white pumpkins are lovely. Thank you so much for stopping by for a visit. I'm happy to be a new follower. and thank you for your sweet comment on my tallboy dresser project. Those creamy white pumpkins are beautiful! I love the ones you made too - I think I'm going to give those a try this weekend. Thank you for the tutorial. I'm so glad you stopped by my blog for a visit and I thank you for your kind comment! Well, you may not do much but you certainly do more than I do anymore. I love decorating our front porch and door but don't do much else. Too lazy to pull it out. What a shame! Always enjoy the charm of your blog. Hey sweetie! Just back from Tennessee & trying to catch up on a bit of blog reading. Are you loving your "NEW" kitchen? I commented on it when you did your post. SOooooooooooo pretty. Love your white pumpkins too. 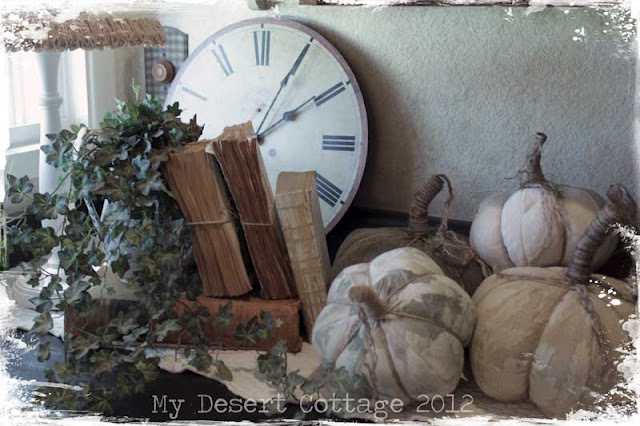 I didn't put out much Fall or Halloween this year as we've had so much going on with all the remodeling & some travel. Plus have BIG Christmas plans so fall will be packed up early & Santa out on Thanksgiving afternoon. It takes me longer each year.... what's that about???? MISS YOU!!!! Let's talk soon. Hope you'll stop by for a visit soon. HUGS! I stumbled upon you while visiting Blissfully White Wednesday. Loved the white pumpkins! They are just my favorite. Your vignettes are beautiful! I just love whites...I could sit all day and look at romantic whites on blogs, and on Pinterest!